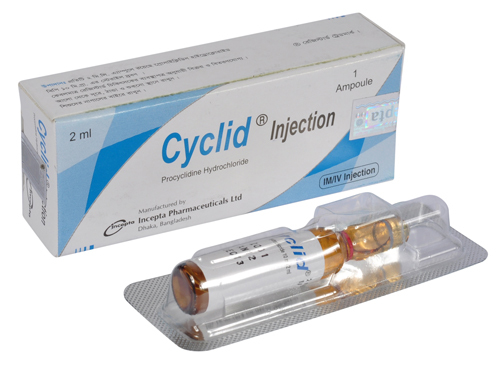 Cyclid 5: Each tablet contains Procyclidine Hydrochloride BP 5 mg.
Cyclid Injection: Each 2 ml ampoule contains Procyclidine Hydrochloride BP 10 mg.
Procyclidine is an antimuscarinic tertiary amine, which acts by blocking excess acetylcholine at cerebral synapses. It also exhibits direct antispasmodic effect on smooth muscle. Adult: Initially 2.5 mg t.i.d increased gradually by 2.5-5 mg every 2-3 days if required. Maintenance dose is 20-30 mg/day in 3 divided doses. Elderly: Preferably lower range is required. Children: Safety and efficacy have not been established in the paediatric age group; therefore, the use of Cyclid in this age group requires that the potential benefits be weighed against the possible risk to the child. Excitability, dizziness, hallucinations, dry mouth, blurred vision, constipation, urinary retention, agitation, restlessness, confusion and convulsions, sedation rather than stimulation and gingivitis may be observed. Precaution should be taken in case of hepatic & renal impairment, children, elderly, pregnancy and lactation condition. Patients with mental disorders occasionally experience a precipitation of a psychotic episode when Procyclidine is administered for the treatment of the extrapyramidal side-effects of neuroleptic. 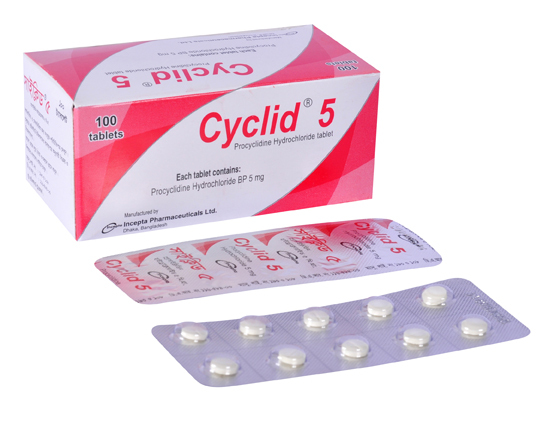 Cyclid should not be withdrawn abruptly as rebound Parkinsonism symptoms may occur. No data is advisable on the safe use of this drug in pregnancy and lactation.